After a hectic day at office I was not in a mood to cook a full course in Dinner instead was thinking of a pot meal that can fulfil my and Pasta’s appetite and I can have it in next morning’s breakfast 😉 ! On this thought I have decided to make some Pasta but not the typical Pasta in White Sauce which I mostly ended on! I took a packet of Spaghetti from my store and was about to take Chicken breast from the fridge for making basic Spaghetti in Red Sauce with a touch of Chicken but found few boneless Bhetki Fish chunks which I actually bought to prepare Mayonnaise Bhetki but Debjani’s cooking ventures are not typically planned ! What’s next 🙄 ! 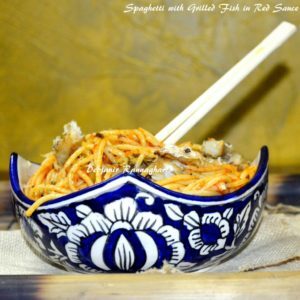 Nothing but experimenting with fish and Spaghetti and ended on a bowl full of Spaghetti with Grilled Fish in Red Sauce a.k.a Tomato Sauce! 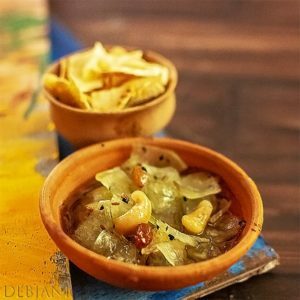 It took me less time to cook this pot meal and I have used Olive oil in it following the typical process of Italian cooking. Since I have opted for grilled fish instead of deep frying it has added health value to my dish. 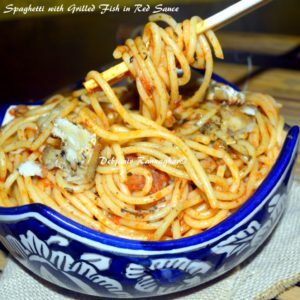 It is really easy to prepare Spaghetti with Grilled Fish in Red Sauce and this can not only served in lunch or dinner but a good choice for a heavy evening food or Jol khabar! Crushed Black Peppercorn: 1 Tsp. Dried Mixed Herb: 1 Tsp. Olive Oil: 1 Tbsp. + 1tsp. 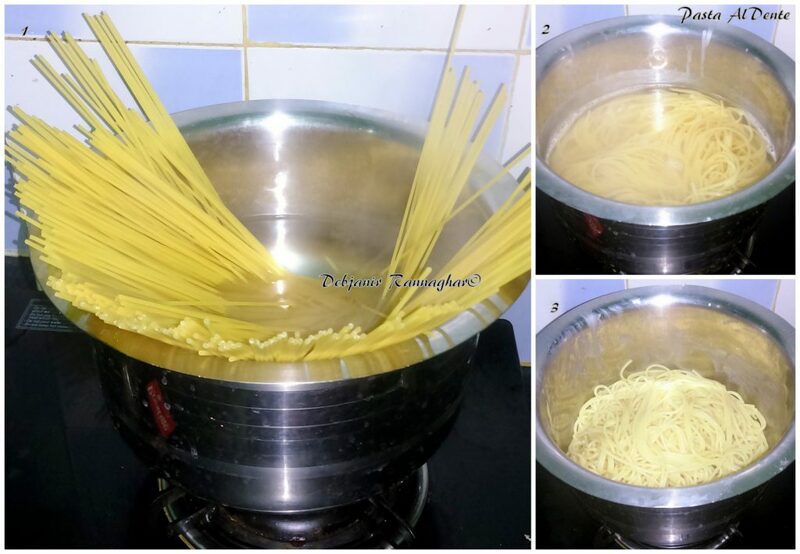 Start Boiling Spaghetti along with salt in around 2 liters of water till reaches Al Dente ( it is a stage when the pasta is firm to bite). It took me 9 minutes of cooking to reach Al Dente. Strain 1 Cup of Water from the Pasta and keep it for future use and discard rest of the water. Drizzle around 1 Tsp. Olive oil over the Pasta and mix lightly. Preheat the oven to 200 degrees C for 10 minutes. 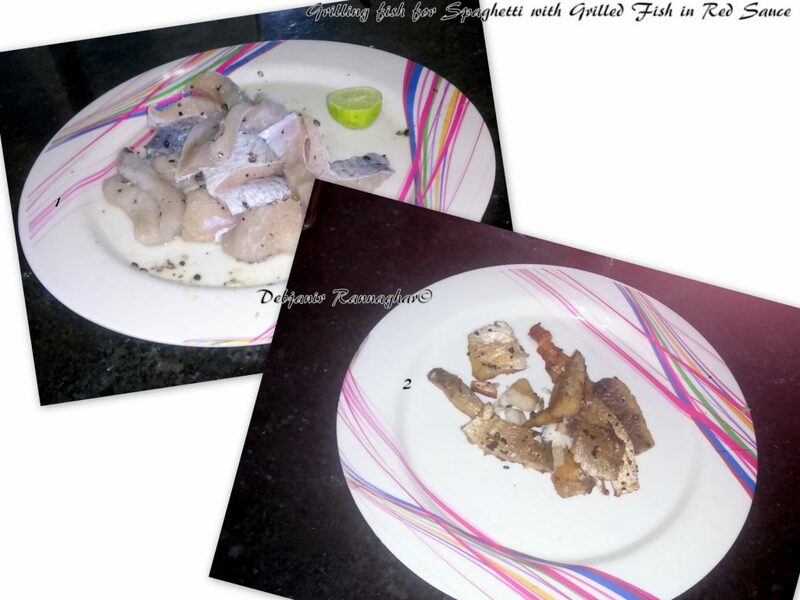 Marinate Bhetki Fish Chunks with Lemon Juice, Salt, and crushed peppercorn and leave it for 10 minutes. Now Grill Fish chunks after drizzling little olive oil for 15 minutes in 200-degree c in a preheated oven. Take the Grilled fishes out of the oven when cooled completely. Crush fish chunks in to bite size pieces using your hand. Make a paste of Tomatoes, Chop Garlic and Onions separately. Heat 1 Tbsp. Olive Oil in a wok and add chopped Garlic in it and cook till aroma comes from the mixture. Add Chopped Onions and cook until those turn light pink in color. Don’t over-fry Onion. Now add Tomato Puree and cook until tomato mixes properly and there is no raw smell in the mixture. Now add salt, Crushed Red Chilli, mixed herbs, Basil Leave and give the mixture a light mix. Add some Tomato ketchup to the mixture. Add Crushed Fish pieces to the mixture and cook for 1 more minute. You can keep few pieces of Grilled Fishes for garnishing. 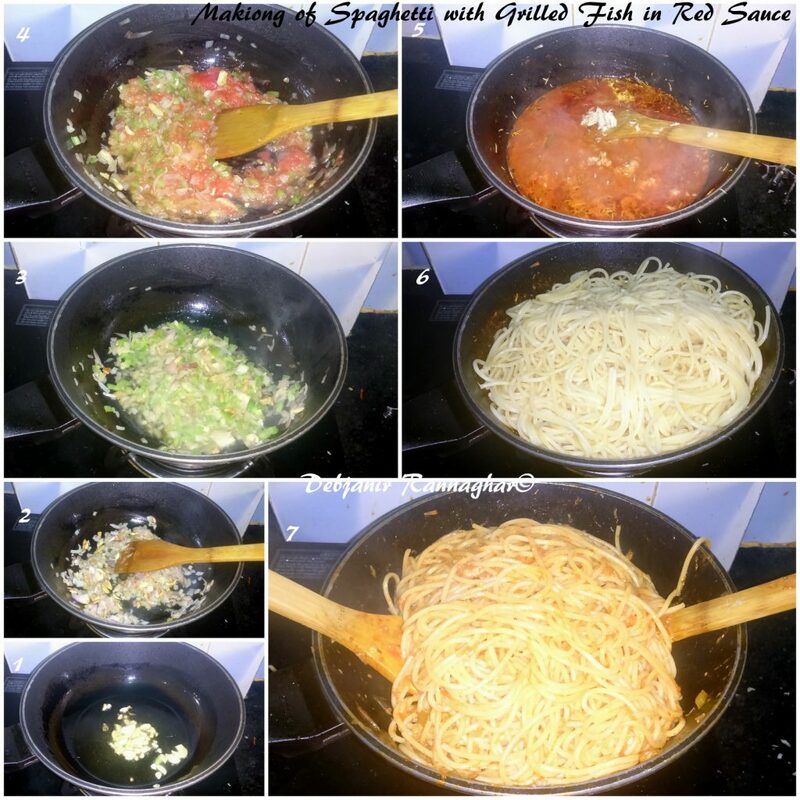 Add 1 Cup of Pasta boiling Water to the Sauce to make it a bit runny and bring it to boil. Finally, add Boiled Spaghetti and toss properly to mix Spaghetti with the sauce. Switch the Flame off and Serve Spaghetti with Grilled Fish in Red Sauce after garnishing with Grilled Fish chunks. More Chili Can be added while making the Sauce. Instead of Dried herbs, fresh herbs can be added for extra flavor. « Black Forest Cake on Pasta’s 2nd Birthday!